My Very FIRST Blog Income Report - $483.31 - and it took me 6 months! UPDATE: Although this report is a few years old now, it is still very relevant. However, if you would like to see more current income reports, I do still share them with my mailing list. I recognize that they’re an awesome learning tool, so I don’t want to stop sharing them completely. Get on the email list to receive income reports here. Part of me can’t believe I’m doing this… writing this first blog income report, I mean. No, I can’t believe I’m doing this because I can’t believe that I have a blog income to report. I started this blog 6 months ago… and I said if I made 10 dollars by Christmas I would keep going. And now, for the first time – this month it feels like a possibility. 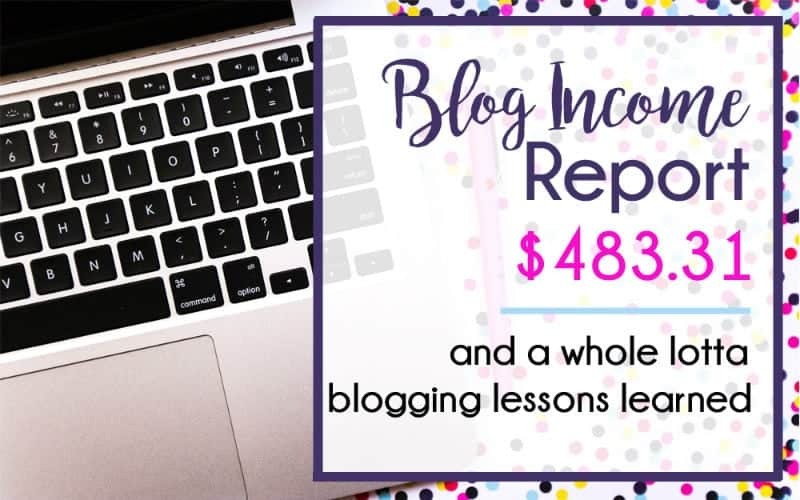 I haven’t earned enough blogging yet to say that I’ve replaced my income, but for in this first blog income report, I can say that I’m well on my way. In just 6 months. UPDATE – September 2016 income report is posted! Read it here. 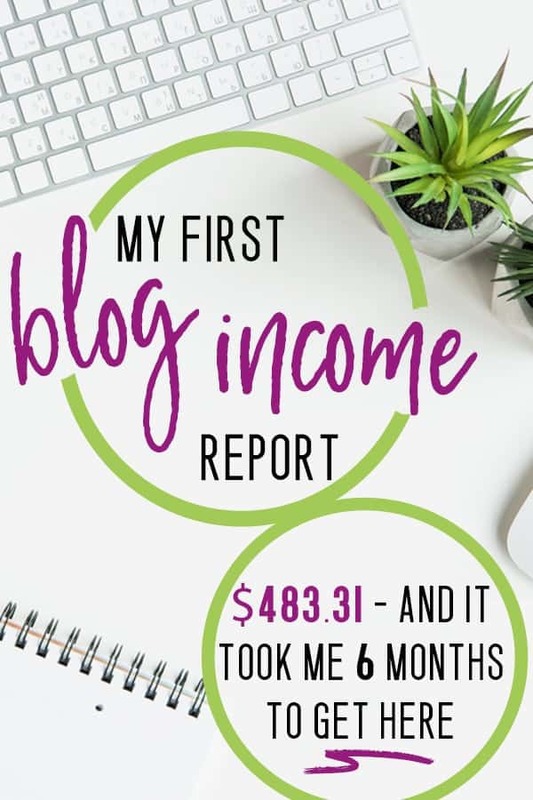 I’m going to spare you the “why I’m sharing my blog income” spiel that you’ve come to expect when you open a blog income report and just tell you that If I can do it, you can do it. If I can write my thoughts here online and put them out there and make money, so can you. I didn’t take a single computer class in high school and 6 months ago I literally did not know the first thing about blogging. You just have to want it bad enough, and be willing to put the time, effort, and money into it. If I had started this blog 6 years ago, when I originally started thinking about it, by now I could be earning full time income – or more. If you’ve noticed that the page views I’m reporting here don’t match the google analytics page views in the photo – yup, you’re right. I had a glitch in my google analytics – which was totally my fault – from the 1st to the 12th of Aug, which caused analytics to record each page view twice (just the page views, not the sessions/users). So to find my total page views for the month, I have divided page views recorded from the 1st to the 12th in half and subtracted that number from the total. You might think it’s disappointing to have to report nearly 60,000 page views less than what analytics shows, but on the contrary – over 150,000 (real) page views for a blog that is 6 months in is more FREAKING AWESOME than I ever imagined possible. I could not be more excited about this number if I tried. You also might wonder if an income of $483.31 is low for a blog with 150,000 page views, and I’d have to say yes – I think it is. You’d think that I could explain that away by saying that since this money was earned in July it’s more in keeping with the kind of traffic I had in July… but that wouldn’t be true either. I had over 150,000 page views in July as well. So why the low blog income for page views? Because I am so new at this that the blog literally ran me over. I was totally unprepared. I had adsense ads installed, but not on every post. I had sort of dabbled with affiliates, but I didn’t really know what I was doing. I hadn’t even considered applying to some of the larger networks, because I thought they would laugh at me – or at best send me away and tell me to come back when I was a grown-up blog. BUT, I am still so excited to write this income report, because mistakes and all, I have never worked harder for anything in my life or felt as proud of the success of anything in my life. And, in hindsight, making the mistakes has been literally the only way to learn these lessons. Blogging is a learning curve, and I can’t possibly have expected to grow a profitable blog without doing some… learning. And learning is awesome, because I know what to do differently going forward. So now I have a plan. I am going to keep doing EXACTLY what I am doing with Pinterest. Why mess with a good thing? I am actually working on a tutorial right now (it’s coming soon!!) that will tell you, step by step, how I have gown this blog to over 150,000 page views in it’s 6th month with Pinterest ONLY. 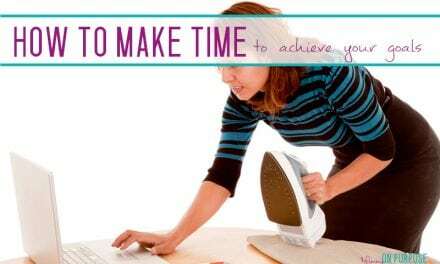 Unlike every other tutorial out there that recommends that you purchase a Pinterest scheduler, doing it my way is free (and, I believe, will get better results). UPDATE: If you are interested in learning more about how I achieved this sorta traffic in this short amount of time the ebook is ready! Two years later, I STILL use this pinterest strategey, and now I get 300k pageviews per month! I am going to sit back and enjoy the income boost from Adthrive. I started working with them a few weeks ago, and the average increase in income is 249% once they get their ads running on your site. I am so excited to see what happens! (You need a minimum of 100,000 page views per month to get your application on their waiting list.) UPDATE: In October I earned over $2000 with Adthrive alone. ummm.. WOW. Read October’s Income Report Here. I am going to work through Elite Blog Academy AGAIN. If I had to pick ONE thing, and say “this is the thing that’s made this blog a success” (apart from the literally hundreds and hundreds of hours I have put into it), I’d say it was Elite Blog Academy. 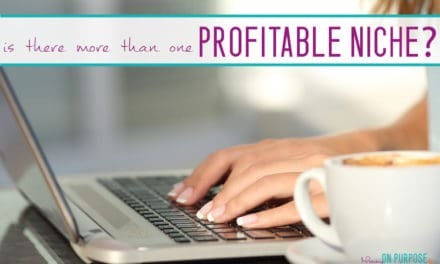 Anyone who wants to build a profitable blog should be taking this course. It’s only available once a year, but you should be working on your blog and waiting for it to open. 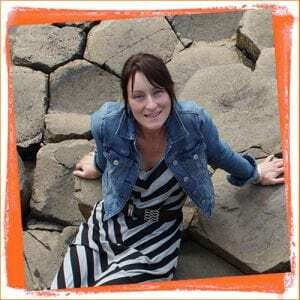 (I started my blog the day I signed up for Elite Blog Academy, so I just happened to be about 6 months (or 6 years) behind everyone else in the course who already had a blog. 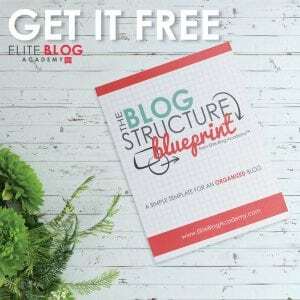 Elite Blog Academy would be way easier if you have a blog up and running, and just need some guidance as to how to make it awesome and profitable. So now that I have a blog, I will do it again, and I believe, benefit even more from it. Once you buy it you have life time access, so this is not going to cost me any more). I am going to be more diligent about content creation. After traffic started to pick up, it was easy to let writing fall by the way side as I scrambled around trying to find ways to monetize what I already had written. (If I had taken Making Sense of Affiliate Marketing already, I wouldn’t have been in this pickle). I’ve noticed that it takes a couple months for a blog post to gain really good traction, and so if you have a month where you haven’t written much, then you are jeopardizing FUTURE months of traffic. I will be posting at least twice per week from now on. I am going to stress a little less about EVERYTHING. I couldn’t tell you the number of nights I have gone to bed after a full day at work and then a loonnnggg evening on my computer, totally stressing out over the money I have spent on the blog, wondering if I’ve thrown it away it or if I’ll be able to make it back or if I’m just wasting my time. And then had nightmares about themes and ads and pinterest. Seriously. But between receiving the first $483.31 of my blog income and getting approved with AdThrive, (and truly ENJOYING blogging), I can see now that the money I spent was an investment, and a totally worthwhile one at that. I can’t wait to share my next income report with you. And I’d love to see how your blogging journey is going – If you’ve published a blog income report for July or August – leave a link in the comments 🙂 Or if you’re just finally convincing yourself it’s time to START your blog – well – get going! Follow this easy tutorial on How to Start a Blog, and never look back. Affiliate Marketing: Can YOU Really Make Money With It? I read your post a little while back and never forgot about it. I thought the day I publish my first post I’ll let you know how encouraging you’ve been. I know there way too much more I need to consistently put in, but part of the faith that I can do it, came from you. H Hena! Congrats on starting your blog!! Thank you so much for coming back to let me know you enjoyed this post… I appreciate that SO much 🙂 (And I HAVE written about the making cents of affiliate marketing course… You can read about it here. Thanks Brittany!! IF you had 3000 pv this month it sounds like things are really movin in the right direcion for you 🙂 That’s awesome! Thank you so much for sharing this, it’s inspiring. I’m not a mom, and I’m not a mummy blogger, but I do blog in different spaces out of passion. 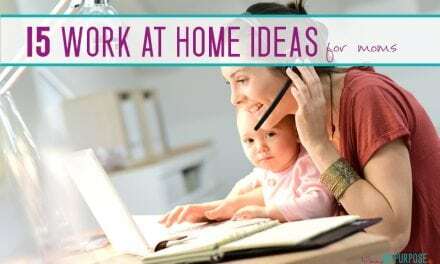 I do wish that one day, I will be able to be able to have the freedom to work from home while doing what I love. Saw that you have other income reports… will definitely follow up!!! Thank You for posting this and being so open! I am currently researching into whether I should start a blog and all of your posts have been extremely helpful! So thank you again! Good luck with your dream of being a stay at home mom! Thank you!!! Its a very amazing realized dream <3 So glad you enjoyed the posts! This is a great post. I’m just starting out and am excited to see someone have so much success in such a short period of time. Your content really resonates with me as well. I created a post about labor/delivery that I was worried was a little too gritty/honest, but happy to see you’ve had success with honesty about subjects like postpartum challenges. Good – I am glad it helped!